On November 13, 2016, about 1400 eastern daylight time, a Cessna 152, N94292, was substantially damaged during a forced landing following a total loss of engine power near Miami, Florida. The private pilots were not injured. Visual meteorological conditions prevailed, and a visual flight rules flight plan was filed for the instructional flight operated by Dean International, Inc which was destined for Miami Executive Airport (TMB), Miami, Florida. The flight originated at Lakeland Linder Airport (LAL), Lakeland, Florida about 1220, and was conducted under the provisions of Title 14 Code of Federal Regulations Part 91. Each pilot provided a written statement, and both statements were consistent throughout. The pilots described the flight as a "buddy" flight, the purpose of which was to build flight time for each. 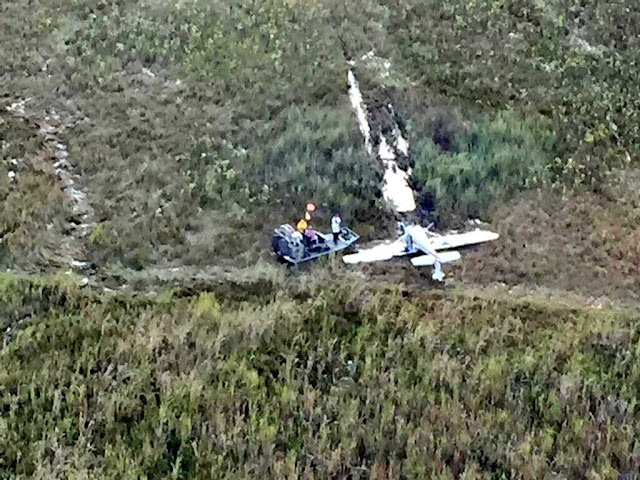 The airplane was in cruise flight over the Everglades about 2,000 feet when the crew noted some engine "roughness." They noted that the engine oil temperature was "normal" but the engine oil pressure indication was "low." The pilot on the controls turned the airplane towards the nearest airport, which was 18 miles from its position at that time. Approximately 1 minute later, the engine stopped producing power, and the crew selected a road for the forced landing. During the descent, an engine restart was attempted and was unsuccessful. The airplane touched down prior to the road on soft, wet ground, nosed over, and came to rest inverted. The pilots egressed the airplane uninjured. During recovery of the airplane, large cracks were noted in the engine crankcase near the number 2 cylinder. The pilot held a private pilot certificate with ratings for airplane single engine land and instrument airplane. His most recent first-class medical certificate was issued on September 8, 2015. 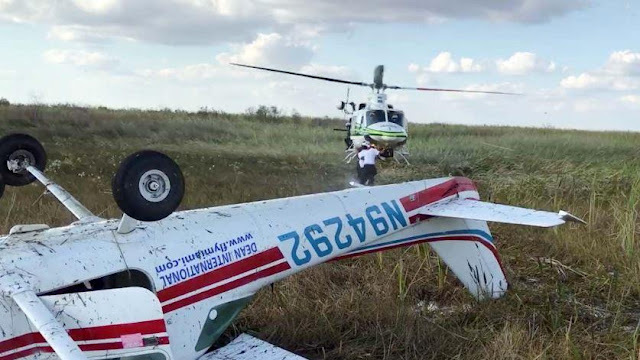 The pilot reported 212.5 total hours of flight experience, all of which were in the accident airplane make and model. The copilot held a private pilot certificate with a rating for airplane single engine land. His most recent first-class medical certificate was issued on July 11, 2016. The copilot reported 128.3 total hours of flight experience, all of which were in the accident airplane make and model. The two-seat, single-engine, high-wing airplane was manufactured in 1982 and was equipped with a Lycoming O-235 series engine. Its most recent 100-hour inspection was completed November 3, 2016 at 10,955 total aircraft hours and the airplane had accrued 52 hours since that date. C&G Aircraft Maintenance, a Dean International company, completed engine overhaul 246 aircraft hours prior to the accident. On November 18, 2016, a detailed examination of the engine supervised by an FAA aviation safety inspector revealed the crankshaft was broken at the No. 3 rod journal and displayed signatures consistent with "extreme heat." The No. 3 connecting rod bolts fractured at the point where the nut contacts the connecting rod. Each connecting rod nut had a flat faced side, and a raised lip side. As found, the nuts were installed with the raised-lip side touching the connecting rod. According to Lycoming Service Instruction No. 1458G, "Nuts to be assembled with flat face side touching the connecting rod." CORRECT INSTALLATION OF THE NEW NUT ON EACH NEW CONNECTING ROD BOLT IS NECESSARY FOR CORRECT CONNECTING ROD ASSEMBLY. EACH CONNECTING ROD NUT HAS TWO DIFFERENT SURFACES, ONE SURFACE IS FLAT AND THE OTHER HAS A RAISED LIP. BE SURE TO INSTALL EACH NUT ON THE CONNECTING ROD BOLT WITH THE FLAT FACE TOUCHING THE ROD AS SHOWN IN FIGURE 2. THE RAISED LIP SURFACE IS AWAY FROM THE ROD. THE CONNECTING ROD BOLT CANNOT BE TIGHTENED CORRECTLY IF THE NUT ON THE CONNECTING ROD IS INSTALLED INCORRECTLY. Great job by a couple of new pilots. Castrophic engine failure they could not have prevented.